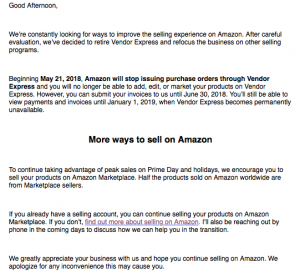 If you’ve been impacted by the unfortunate news regarding the pending closure of Amazon’s Vendor Express, please reach out to one of our onboarding specialists to see if we can help with the migration of your inventory and listings to Amazon Seller Central, eBay, Walmart, or one of our other supported eCommerce platforms. As part of Sellware’s Strategic Service offerings, we advise our clients to actively monitor and diversify their selling platforms and marketplaces, to ensure that unanticipated situations like this can be quickly mitigated. For sellers with an active Vendor Express account, and a well documented CSV or file feed, Sellware will waive the the first 10-20 hours of traditional onboarding fees, and work with you to connect your account to our multi channel sales platform to help minimize any interruptions to your business.